Now that winter is coming we’re planning on getting the “home group” back up and running in some form. My plan right now is to gather some interesting videos that we could use as points of discussion, etc. We may not use that every week, but if I can get some good ones (not boring) we could at least use that occasionally. I want to make sure we’re really accomplishing something spiritual if we do this; fellowship is great, and it’s important, but we need to make sure we’re getting fed spiritually, too – especially in light of the times we are living in. We bought some solar flood lights for loading the wood stove at night. They worked ok till it got cold. Then the lead acid batteries would freeze up and no light. Also, snow would lay on the solar panels making it not charge. I think solar is the answer, but the batteries will need to be inside so they don’t freeze up and a system for keeping snow off the solar panels will have to be instituted. Incidently our solar path lights use a nickel cadmium battery and they seem to work no matter how cold. Although NC batteries develop a memory over time and won’t stay lighted as long as they once did. A steel pole building is much more cost effective to put in and will last longer with less maintenance. I figured on leveling where my wood pile is and putting it there. It’s right at the end of the driveway in an area that isn’t used for much, but yet close enough to the house. Also it’s close to the wood stove so there won’t be loss of heat when heating it. I hope to use it partially as an office and a garage so heat is essential. It would be partially funded by NIC since it would used as an office. A rough cut from scratch building has one extra benefit. I could build it two story and have offices in the upstairs. The rough cut look won’t matter really if I get real siding on my house. The steel buildings come in all kinds of colors and I would just make it match the house. The steel buildings can be disassebled and moved if you really needed to, but a rough cut building is permanent and has to burned down. Again with the sweat and time to build a rough cut building. Do you have time, coz I sure don’t. We have a lot of kids in our family. 4 to be exact. We currently have a crappy minivan and diesel suburban. Having the truck has been great for towing the camper and hauling lots of stuff inside, however we still have a need for a pickup truck. I started researching around. I really like the Dodge trucks because they come with the Cummins Motor. Chevy truck supposedly have the best ride on the road. 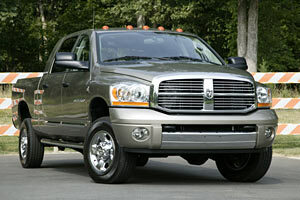 After reading a bunch of reviews on Ford, Chevy, and Dodge, I have my heart set on a 2006 or newer Dodge Mega Cab. Dodge came out with the Mega Cab in 2006. They shorten the 8ft bed to 6ft 3in and used that extra room to give the back seat 42in of leg room. The thing is perfect for a family our size. The bed is a little smaller then I would prefer, but I think it will be worth the sacrafice for the extra back seat room. There is also over 7 cubic ft of storage behind the back seats. Quite incredible. This is a good article on it. As noted in the meeting minutes, we’ve decided to do two breeds of chickens, one meat and one egg. We need to move on to the layout and expense of housing for these creatures. Several of our members are involved in Weight Watchers, and that seems to be producing results. As we all know handling our own waste is one of the major challenges that faces us, especially if we want to move forward with the idea of housing more people on our land. The Humanure Handbook is the best answer I’ve come up with so far. We need to see how that pans out. This summer we are planning on building a “test” compost toilet. One of the things I have considered as a possible financial resource, and also as a way of promoting the goals of Big Oak Ridge, is to open a Bed and Breakfast. We can discuss this idea here and consider what that might entail. Let’s say we want to talk about green beans. The average serving of green beans is one cup. If you want to make a meal for 10 people who each get one serving of green beans, that’s 10 cups of beans. If you want to do this three times a week, that’s 30 cups of green beans. If you want to do that for 52 weeks (which is one year) that’s 1560 cups of green beans. Let’s say that on average we get 2 bushels of beans from a 100 foot row. That would be about 128 cups of beans. That means we would need twelve 100 foot rows of beans to get enough beans to feed 10 people for year! This math may not take into account intensive gardening such as we would like to use. Another book we looked at says that you need 2 100 foot rows of beans to produce enough beans to feed a family of six. Either way, I think you get the idea. It will take a LOT of garden space to feed the number of people we’d like to feed (and have some to sell?). We need to figure out how much garden space we really need, and we need to make sure we optimize our productivity.